Music holds a special part in most everyone’s life. 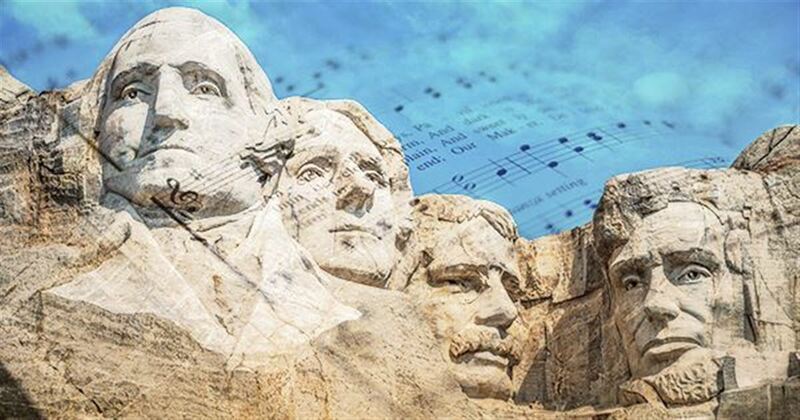 Check out the list below to see how 19 of our presidents regarded music and what each of their favorite hymns were! These hymns may have been influential during their presidential years or meant something special to them and their spiritual development. Do you have a favorite hymn that you just can’t help but sing whenever you hear it? Our first president loved music, even though he could not play any instruments. George and Martha Washington did love hymns and would sing hymns to their children every night before bed. He was also one of the first two Americans to buy an American made piano. Washington’s favorite hymn, “How Happy is He Born and Taught,” is based on Psalm 67. Thomas Jefferson was one of our most musical presidents and was a very skilled violin player. His wife was also a talented musician. Jefferson was a Baptist and attended a church near Charlottesville, VA. He went to college at William & Mary and there he played violin duets with his friend, Patrick Henry. Jefferson’s favorite hymn, “Hark, The Glad Sound the Savior Comes,” was written in 1735 by Philip Doddridge. John Quincy Adams was the only president that actually wrote hymns. He wrote a total of 5 hymns in his lifetime. He was also the only president who served 17 years as a representative after he ceased being president. John Quincy Adams wrote his favorite hymn, “Send Forth, O God Thy Light and Truth,” and based it off of Psalm 43. James Buchanan was the only president who was a bachelor. He had adopted his orphaned niece, Harriet Lane, who took on the role as the official hostess of the White House. His favorite hymn, “God Moves in a Mysterious Way,” was written by William Cowper in 1773. The title of the hymn has become a popular saying, encouraging people to trust God in the face of trouble or uncertainty. Theodore Roosevelt was very outspoken about his faith. He was also outspoken about his singing, even though he was known to not have the best singing voice. His favorite hymn was “How Firm a Foundation,” written in 1787. President Woodrow Wilson was a good Christian man who said grace at every meal, read his Bible regularly, and attended weekly prayer meetings. He was also a talented singer who loved to sing to the accompaniment of a harp. His favorite hymn was “When Peace Like a River,” a popular song that brings comfort to many. Warren G. Harding was our first Baptist president. He was also the only president who could play every instrument in a brass band except for the trombone and E-flat clarinet. His favorite hymn was “Lead, Kindly Light.” The song was written by John Newman while he was on an orange boat traveling from Sicily to France. John F. Kennedy was our only Catholic president. He was fond of the arts and supported the National Culture Center plans, which then became the Kennedy Center for the Performing Arts. His favorite hymn, “Holy God, We Praise Thy Name,” has had wide circulation in both Catholic and Protestant hymnals. President Nixon was a talented musician and could play the piano, violin, clarinet, and saxophone. He was also a Quaker and played the piano for a Quaker meeting house in California. While he was in the White House, he put on 26 worship services. “He Will Hold Me Fast” was known as his favorite hymn. Jimmy Carter was the first president to be born in a hospital. He was raised on his family’s farm and grew up going to a Baptist church. His favorite hymn was the popular song “Amazing Grace, How Sweet the Sound.” This has become the most recorded tune in the history of the recording industry starting in 1922. George H. W. Bush was a talented singer and was a member of the Yale glee club. He enjoyed country and western music because of the stories that those songs would tell. He was a war hero and Navy veteran, which is why the Navy hymn “Eternal Father, Strong to Save” was his favorite. George W. Bush was a fan of hymns. He would even use parts of stanzas from hymns in his speeches sometimes. His favorite hymn is “A Charge to Keep I Have” and even had a painting in the White House that was named with that same title. Charles Wesley wrote this hymn in 1762 and based it on Leviticus 8:35. The song is very popular with the Methodist church.